› Graduate in four years: It really pays! Graduate in four years: It really pays! While we would love to keep our students around forever, we know that helping our students graduate in four years will not only save you time but also significantly increase your earnings and reduce your debt. 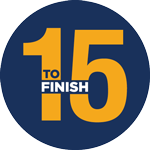 So to keep you on track for graduating on time, in four years, USM has launched Fifteen to Finish, an initiative encouraging our students to complete 15 credits every fall and 15 credits every spring — or, if 15 credits each semester is not possible for you, to take advantage of our summer courses and winter session to make up the difference. Browse year-round courses. Most USM programs require 120 credits to graduate. Of course, if you opt to take summer courses or winter session too, you can graduate in four years with less than 15 credits/semester — or better yet, graduate even quicker and save even more time and money. When you add it all up, graduating in four years instead of five or six can mean tens of thousands of dollars to you — possibly even more! The key is to take 30 credits per year. For more information, email Academic Advising or call 207-780-4040. When you register for 15 or more credits in a semester, you will receive a 15 to Finish button. This button qualifies you for once-a-month 15% discounts at any Sodexo Dining area and the USM Bookstore (not valid on Bookstore course materials, sale items, or marked down items). The discounts begin in September and continue through the academic year. This is our small way of congratulating you for making a wise decision to take a full load of courses. The quicker you graduate, the more money you will save, the fewer loans you will accumulate, and the greater wages you will earn. If you need assistance with the QBOT app, check with a Sodexo or Bookstore employee.